I think I'm finally tired of being sick and tired! Yes, after let's see, 10 days.... I finally feel better. Good thing too because we had our big Santa Barbara weekend this past weekend. Found out Beckie's new little one is a BOY!! Yes, we are happy and excited about that. Everything is fine, heart beating measurements where they should be for his age. Now it's just the waiting game. 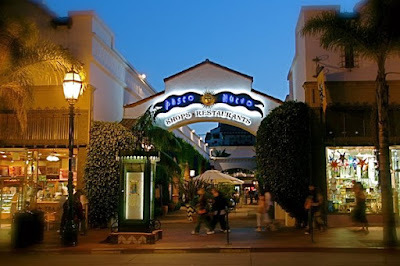 After the appointment, we headed downtown for some shopping at Paseo Nuevo Mall. Kristen had never been to Santa Barbara that she could remember, so we showed her all our favorite "haunts". Next, it was down to the waterfront to look at the Sunday craft faire, Stern's Wharf and enjoy the local flavor of the town. Scotty got to ride on a really nice Merry-Go-Round. They told us later that we couldn't take pictures.... ummm, too late! And check out this contented group AFTER going into the candy shop.... come on you guys, have a little fun!!! He he he he. It was a marvelously fun day and we were WORN out by the time 9:00 rolled around. Hope we are able to take another family day out again really soon!